MAKING YOUR PROBLEMS MINE « THE BRYCE IS RIGHT! « DO NOT USE TRAVELOCITY! 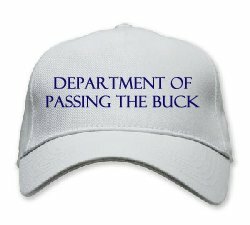 – Where should the buck stop? Have you ever noticed how people try to make their problems yours? Let me give you an example, we have a small garbage dumpster next to our office building and other people began using it to dump their trash as soon as we installed it. Of course, we then put a lock on it but this didn’t seem to deter a few people who put their trash on top of the dumpster. We even had one instance where someone deposited an old sofa on the dumpster which caused me to pay the garbage man a little extra to dispose of it. In other words, people transferred their problems to me. There seems to be a lot of this going on, particularly among Customer Service people. A lot of the service people I talk to seem to be more interested in compounding my problems as opposed to solving them. Nobody really likes to deal with problems, but if that’s what you’re getting paid to do I fail to see the rationale of complicating life as opposed to simplifying it. You see this “pass the buck” mentality just about everywhere, not just in the office but at home as well. It has become so prevalent it’s like a giant merry-go-round with everybody passing their problems on to someone else. Here’s an idea; why not pull the plug on the ride and have everyone address their own problems, it’s what we call “responsibility,” something a lot of us cannot seem to accept. As to our dumpster problem, we picked through a couple of bags of garbage that had been dropped off on us and found the name and address of the person who dumped it. We then dutifully returned the bags of trash to their rightful owner who was unhappy to see it returned. I think we need to see more of this type of action, instead of letting the buck stop on our doorstep, how about returning it to its rightful owner? NEXT UP: MAKING YOUR PROBLEMS MINE – Where should the buck stop? This entry was posted on August 30, 2013 at 6:00 am	and is filed under Life, Social Issues. Tagged: Florida, MAKING YOUR PROBLEMS MINE, palm harbor, The Bryce is Right, tim bryce. You can follow any responses to this entry through the RSS 2.0 feed. You can leave a response, or trackback from your own site. I just had such an experience. For the past three weeks my home alarm has been tripping every day. When the alarm monitoring company called us, it was always the same issue…the main living area motion detector. The company made two visits to the house to work on the system and never once did they replace that motion detector. The problem persisted. Finally, I demanded they replace the detector or remove the system…they complied…problem solved. Up to that point, it seems that it was more my problem than theirs yet they were charging me a monthly fee. Bill Clinton taught us that it is okay to do just about anything as long as you don’t get caught…that is the real crime it seems. Bully for you on that garbage! Yea, I don’t think the guy liked getting his garbage back.